Senate President Pro Tem Joe Scarnati, a Republican from Jefferson County, in the state Capitol. HARRISBURG — With outsider candidates from the left and the right having success in last week's Pennsylvania primaries, some high-ranking legislative leaders are discussing opening the nomination races to independent, or nonaffiliated, voters. 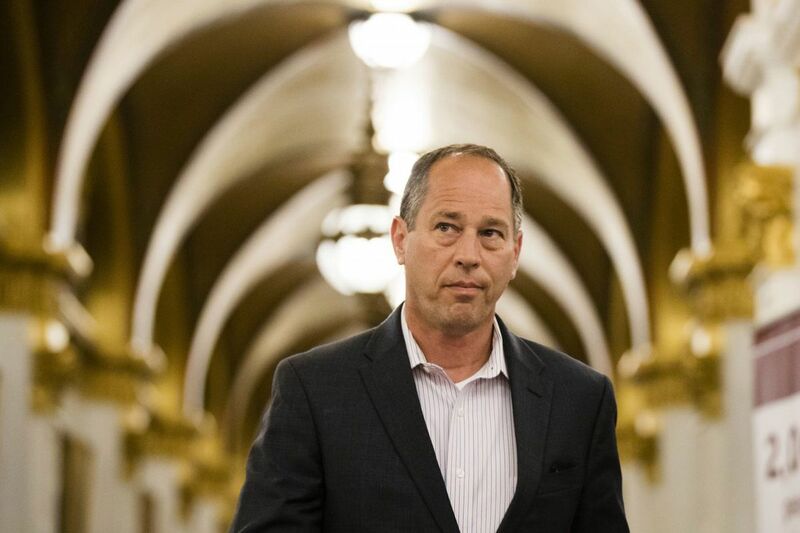 Senate President Pro Tempore Joe Scarnati (R., Jefferson) Monday told a Press Club luncheon that he intends to introduce legislation that would open up the primary process. As it is, voters must be registered with either the Democrats or Republicans to participate. "The extremes of the parties have taken over the primary process," Scarnati said, pointing to the upset of a Republican state senator in western Pennsylvania by a conservative insurgent, and also to the defeat of two veteran Democratic state representatives in the region at the hands of candidates endorsed by Democratic Socialists of America. "And by far, I'm not a moderate and I'm not a liberal," Scarnati continued. "I'm a conservative. But I don't know that I fit the new brand of conservatives, and I'm not so sure that some of the Democrats in the Senate Democrats fit the new brand of liberals." The political landscape is changing, he said, "and I don't think it will end with good results." House Majority Leader Dave Reed (R., Indiana) has also expressed support for the idea of opening primaries to independent or nonaffiliated voters, going so far as to circulate a co-sponsorship memo this month outlining plans to open the primaries to them. Reed, speaking to reporters this month, noted that many local elections (such as those for school boards or local councils) are often decided at the primary level. "I think giving independent voters that opportunity could help really reform the electoral process, get more people involved and hopefully get a more diverse set of opinions in the primary process, as opposed to only a select few choosing who gets to go on," Reed said. A spokeswoman for Sen. Minority Leader Jay Costa (D., Allegheny) signaled he would be open to the proposal. "Senator Costa is a strong supporter of active, participatory democracy – and is in favor of all legislation that allows more citizens to vote, and increases turnout amongst already-registered voters," said spokeswoman Brittany Crampsie. House Minority Leader Frank Dermody (D., Allegheny) has not taken a position on the issue, according to a spokesman. Passing legislation to open the primaries — let alone doing so in time for a 2020 election — would be a very difficult task. Scarnati's bill will likely be introduced in the coming weeks. Reed's bill did not appear to have been introduced as of Monday. Depending on how the bills are ultimately worded, they may require amending the state constitution. To change the state constitution, a bill must pass in identical form in two separate sessions and be approved by voters.